Welcome to Just Ahead’s Yosemite Trip Planner—our guide to what you need to know to plan your trip to Yosemite National Park. 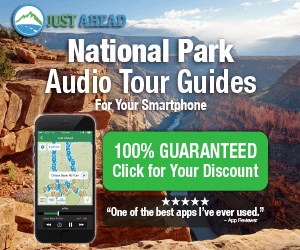 Click here to see the complete series—and be sure to download our Just Ahead smartphone audio tour of Yosemite before you leave. We’ll steer you to and through the park and point out its inspiring viewpoints and scenic wonders—plus we share entertaining and educational stories all along the way. It’s like having a friendly tour guide along for the ride. Yosemite Falls from Glacier Point. Photo: Kenny Karst/DNC Parks and Resorts at Yosemite, Inc.
Yosemite National Park is a place of awe-inspiring beauty, where you’ll see granite monoliths towering 3,000 feet above placid meadows…giant sequoia trees nearly 300 feet tall and 25 feet in diameter…and waterfalls as high as 2,400 feet. Yosemite Valley is by far the most popular part of the park, but it represents less than one percent of its land area. There’s much more to see in Yosemite, and Just Ahead’s Yosemite audio tour guides you to all the best places in the park. Glacier Point offers a bird’s eye view of Half Dome and beyond. Photo: DNC Parks & Resorts at Yosemite. If you’ve never ventured out to Glacier Point, you’ve missed one of the world’s most sublime views. You might pick out your campsite in Yosemite Valley, more than 3,000 feet below. Across the way looms Half Dome, and off to the right are Nevada and Vernal Falls. The tall peaks of the Clark Range and Yosemite’s high country form an inspiring backdrop. Hint: In peak season, try to start the 16-mile side trip before 10 a.m. or after 4:30 p.m. We point out all the highlights along this extraordinarily beautiful drive, which is closed in winter. Bridalveil is the Old Faithful of Yosemite waterfalls. When other waterfalls slow to a trickle in late summer or early fall, Bridalveil maintains a semblance of its fully flowing beauty. Hint: Don’t just view it from afar. Make the walk to its base—620 feet of wind-whipped mist will spritz you as you approach on the half-mile walk.